Bob Knight is a folk/traditional singer based in Aberdeen, Scotland. As well as traditional songs, he also writes new songs in traditional Scottish style, using Scots and Doric. For his own songs he accompanies himself on guitar, but traditional material, for the most part, is often sung unaccompanied. He is also an excellent story teller and gives talks on song-writing. Bob is a very experienced musician and performer, and through his mother, Margaret Stewart, he is related to all the great Scottish traditional singers of traveller origin. In recent years he has been booked to perform at the prestigious Whitby Folk Week, 2012, 2013, 2014, 2016, and again this year, 2017. He will also be performing at Cullerlie Traditional Song Festival, 2017, in Aberdeenshire. Bob has also appeared at Celtic Connections (Glasgow) gaining a highly commended award in the Danny Kyle Open Stage event. The Portsoy Boat Festival, The Rolling Hills Club and Festival, and many clubs in various parts of Scotland. 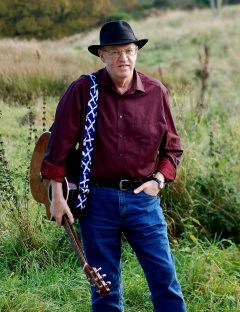 He has also won various song writing competitions including the Falkirk Folk Club song writing competition, and the Glenfarg song writing competition.